Noah (2014) is midrash on the story of Noah from Genesis 6-10. As is the case with many Biblical tales, the bare-bones version in the text would not make for much of a film. At one time, Hollywood simply added a love story to spice things up (see The Ten Commandments (1956), and later Disney sought out some classical rabbinic midrash to fill out The Prince of Egypt (1998). I think most people think of the story as the guy with the long white beard and the animals two by two, and it’s a jolly story, a nursery story for kids. But for me, I kind of sympathize with the people who didn’t get on the boat, thinking maybe there’s wickedness in me and I wasn’t good enough. So I always found it as a very scary, a first apocalypse story. Adam and Eve were expelled from Eden for disobedience. Their child, Cain, slew his brother Abel. Cain’s descendants took off into the world, aided by some fallen angels. In the Biblical text, there are two mentions of Nephilim, which is often translated “giants” but Aronofsky and Handel interpret as fallen angels (from the Hebrew root nun-pay-lamed, to fall). These angels, called “Watchers,” fall from heaven literally into the mud of earth out of attraction to humanity, and the combination of their heavenly fire and the earthly mud re-creates them as rock creatures. The Watchers become disenchanted with the sons of Cain, who only want to exploit the earth, and they abandon humanity. When Noah (Russell Crowe) receives his call to build the ark, first in a dream and then via a hallucinogenic tea from his grandfather Methuselah (Anthony Hopkins) he encounters the Watchers and asks for their help. They gradually become intrigued by him and take the risk of assisting him. This action and contrition for their rebellion brings about their own redemption, a contrast to the uncontrite human beings who die in the flood. Cain’s descendants led by Tubal Cain are a hunter/industrial society under the rule of Tubal-Cain, the bad guy in the film. They have managed in only ten generations to mostly lay waste to the earth with mining and hunting. They have long threatened the peaceful and vegetarian descendants of Seth, and once they hear Noah’s prediction of a deluge to come, they want on the boat. The big departure from the Biblical story is that in the Bible Noah and his sons Shem, Ham, and Japeth are named, but they all have unnamed wives who are included in the salvation by ark. In the film, Mrs. Noah (Jennifer Connally) is called by the name she carries in Genesis Rabbah, Naamah. The eventual Mrs. Shem is played by Emma Watson and named Ila. Ila is much easier to pronounce than her name in the Book of Jubilees, Sedeqeletelebab. As for Mrs. Ham and Mrs. Japeth, to say much about them would spoil the story. Suffice it to say that the story of the wives of Ham and Japeth is where the most interesting conflict in the story emerges. “The Creator” is a very distant personage in this story, who speaks through dreams and visions. There is an interesting echo of the story of Abraham as well, as Noah struggles with his interpretation of the commands of the Creator. He believes he understands the message, and then something happens that calls his interpretation into question. He also suffers from survivor guilt; he is written here as a man chosen precisely because he loves life and loves Creation, and yet he is commanded to drown most of humanity and all but a remnant of the creatures on earth. The character arc in the Biblical story is really God’s – God moves from anger and destruction to mercy and love. In this version of Noah, the arc belongs to the title character. 1. Aronofsky has said that he wanted to tell the story of Noah “for the 21st century.” How is this story specific to our time? Are there any contemporary issues upon which it comments? 2. We normally see angels pictured as beautiful creatures. What did you think of the Watchers? Did they seem to be angelic to you? Did watching them affect your ideas about angels at all? Why do you think Aronofsky called them Watchers? 3. Do you think God speaks to human beings? How can a person who believes he has received a divine message be sure he has understood it properly? 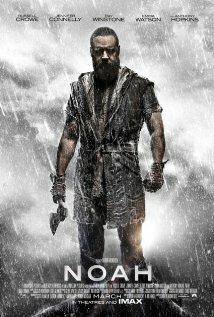 If you were Noah, and you had the experiences Noah did in this film, how would you have understood your mission? Would you have been willing to carry it out? This entry was posted in United States and tagged Aronofsky, Bible, Noah. Bookmark the permalink. Nice. Just a heads up. Disney didn’t make Prince of Egypt. Dreamworks did. Thank you! – Quite right.